John Carpenter's original horror masterpiece The Thing is one of my favorite horror flicks and actually the first horror movie I ever saw as a child (I remember my father regretting letting me seeing it, after I came screaming into his room the next three nights demanding to sleep in his bed). It has been rumored like most other classic horror films that The Thing would also be getting the remake or re-boot treatment very soon. Well the guys over at Latino Review have some inside scoop regarding the film. El Guapo of Latino Review briefly spoke with Marc Abraham who directed "Flash of Genius" releasing later this year and has been a producer on films like Air Force One, The Hurricane, Spy Game, Dawn of the Dead, and Children of Men among many others. Abraham had this to say when he was asked about a remake/sequel to The Thing, "This is more of a prequel than a sequel, there is your exclusive. Its going to be taking place in the same time frame." Abraham did not give alot of sustance to his "exclusive," so El Guapo pushed further and asked if this meant we would get to see the origin of the alien and what exactly happened to the Norwegian research team. Abraham replied, “These are the events leading up to the 1982 film.” Nice! Fans of the original should be excited by these comments, I know I am! Without saying too much Abraham clarifies that this film will definately not be a remake, but a prequel that will lead up to the events in the original 1982 film. I am sure the film will follow the same basic pattern as the original, considering for those of you who may have never seen in it, follows a American research team in Antartica that finds a nearby Norwegian research team that has been infiltrated by a shape-shifting alien that in turn attacks the American team upon investigation. 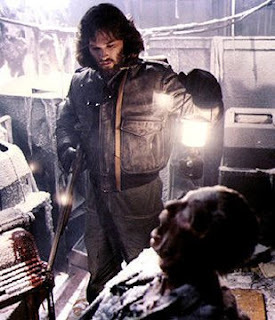 The Thing was a scary film that set an amazing precedent for Carpenter's career. Hopefully this prequel can measure up, one thing is for certain it definately has the potential! What are your thoughts on a prequel to The Thing? Will they try to make a Kurt Russell cameo? I don't think it is needed, but would be cool!